Dimensions (HxWxD): 1.375" x 1" x 0.375"
Golden Siberian Quartz is lab quartz grown in Russia & is said to be "a powerful balancer, balancing the male & female aspects as well as right & left brain. Helps to create synapses between the right and left brain. Aids in connecting the higher self, accelerates the delveopment of psychic abilities" according the jeweler who creates these flower of life pendants. 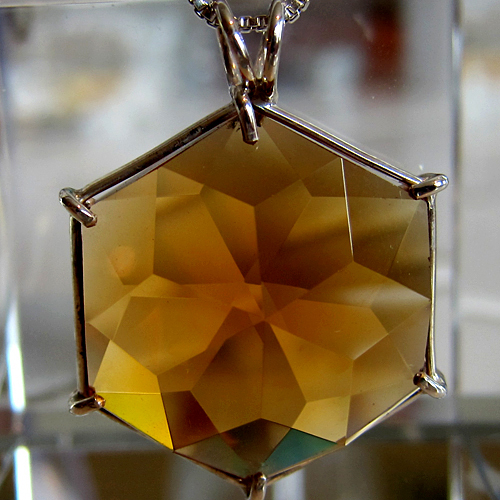 This beautiful gemmy water-clear Large Golden Siberian Flower of Life Pendant in sterling silver comes with a sterling silver chain in its own velvet jewel box. Siberian Golden Quartz exhibits an energy signature very similar to the highest grade of gemstone quality citrine, resonating with the yellowish-golden coloration associated with the solar plexus and heart chakras. Siberian Golden Quartz also resonates with the Golden Glow of Christ Consciousness, and can be used in many meditation practices designed to quicken the Ascension process. In the Western chakra system, the crown chakra is associated with the color violet, but white and gold are alternate colors also seen around the energized crown chakra.